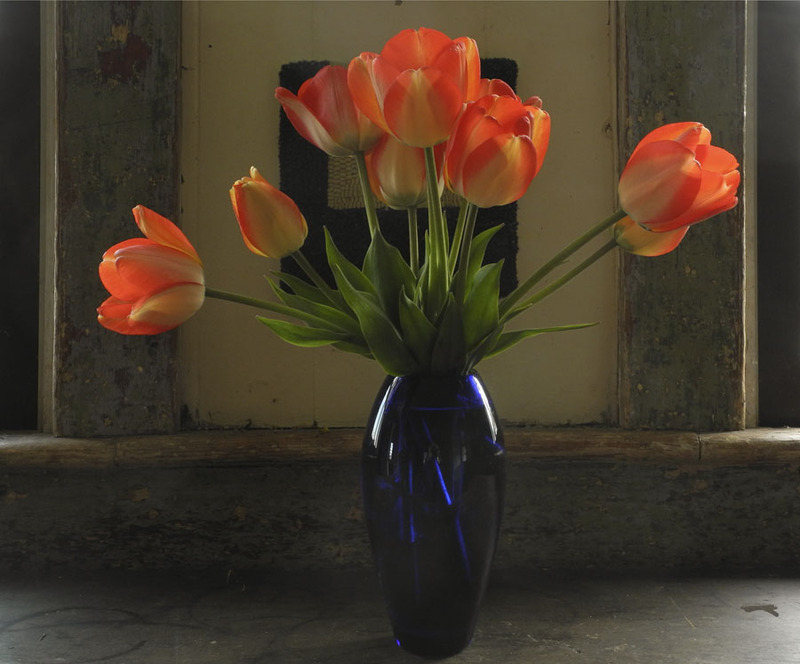 For me, the full beauty of a tulip is only expressed once it is cut and placed in a vase. They are pretty enough in the garden, but it's only when arranged in a group, or placed singly in the perfect complement of a vase and location, that their elegance can be seen. I cut many different flowers and bring them in the house all spring and summer, but other flowers are also beautiful in their natural setting: a large shrub covered with lilacs is more thrilling than a bunch in a vase; as much as I love cut peonies, they are just as complexly seductive on their plants. 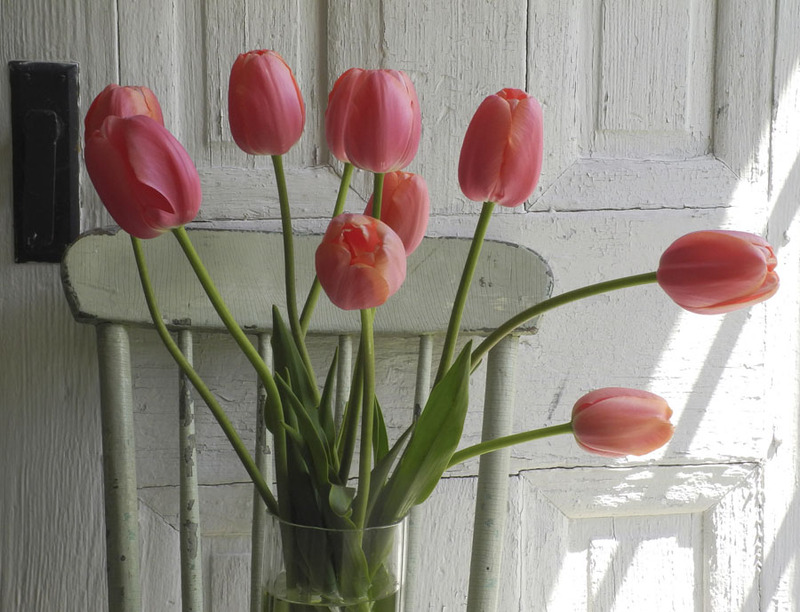 Because I feel this way, each fall I plant several kinds of tulips in a row in the vegetable garden, just for cutting. Even the interiors of the flowers have clear and dramatic forms; the central pistil with its three part cap, and the flowing towers of stamens surrounding it. 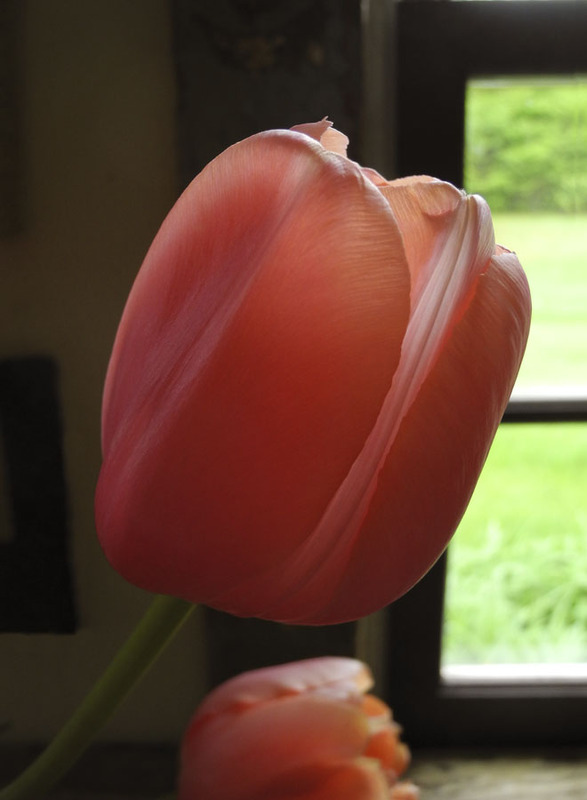 This is an unknown tulip, mislabeled, so I can't tell you its name. 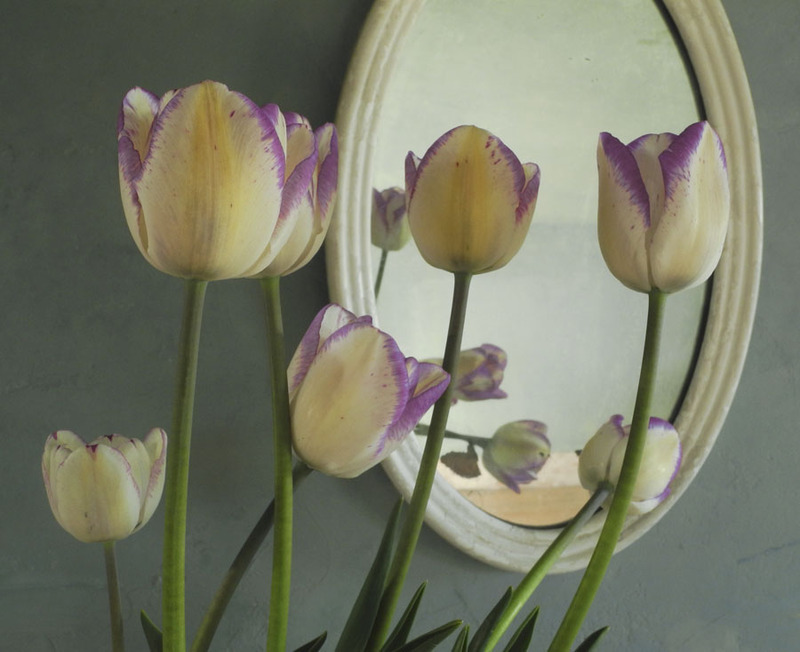 A delicate violet edge on a creamy white petal gives a subtle effect. The outward curving petals of this lily-flowered variety give the flowers a delicate grace. 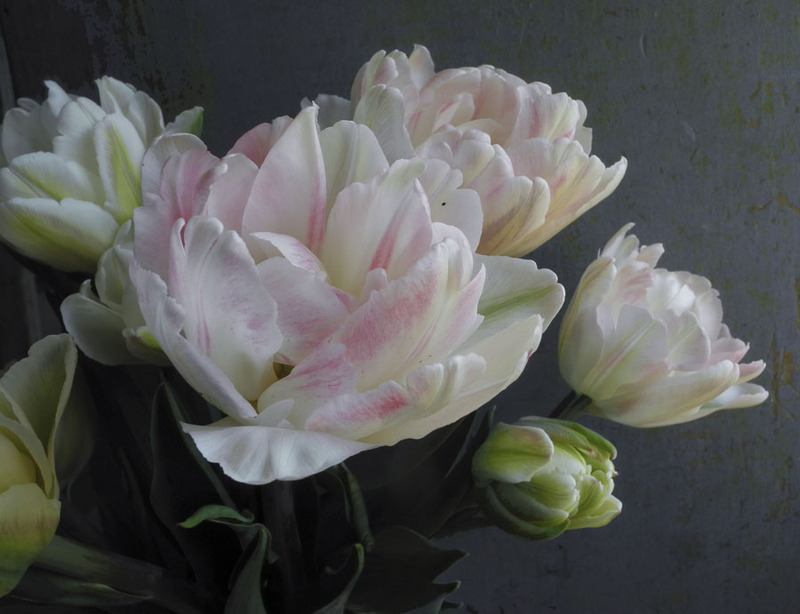 A favorite tulip of mine, Angelique mimics my favorite flower, the peony. It has a frothy loveliness, each petal subtly different in color and shape. When Laura Fygi was just cut and brought indoors, the flowers were closed in a form like a rounded cone, each flower showing red, and yellow at its edges. 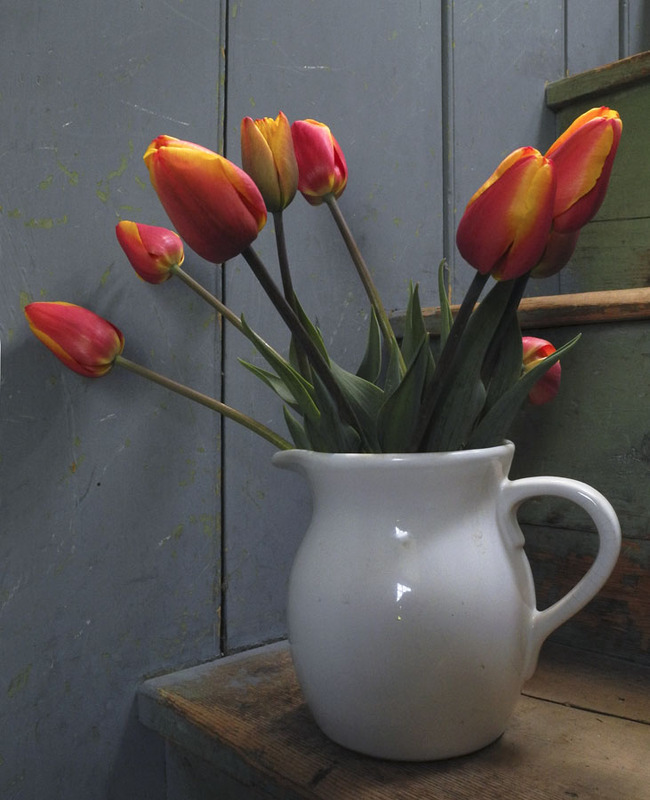 And then....one of the joys of watching tulips is seeing how their forms change, from a closed cone to an open cup, the stems curving up and down, becoming more fluid as they age. 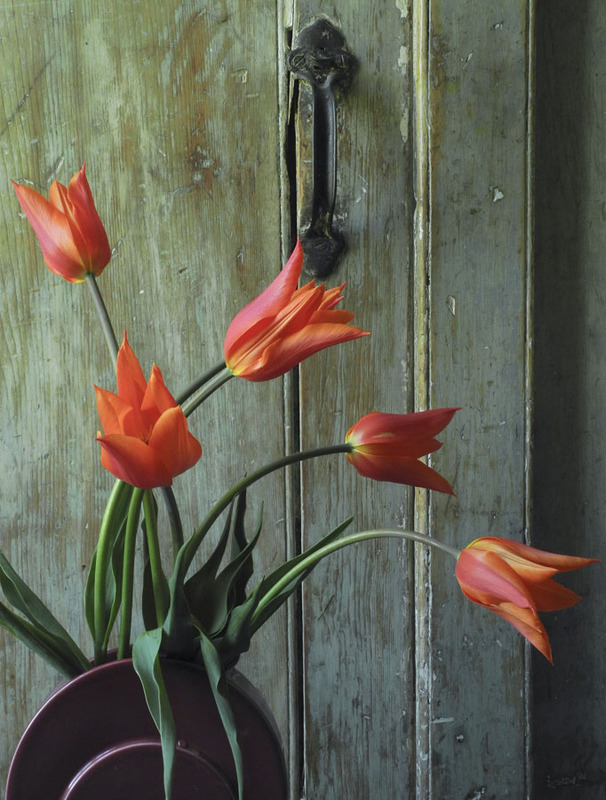 Menton is another beloved tulip; it is a tall, large, gracious tulip of classic form. Its color is a warm pink that shades to a lighter and warmer hue at its edges. It is a queen in its bearing. 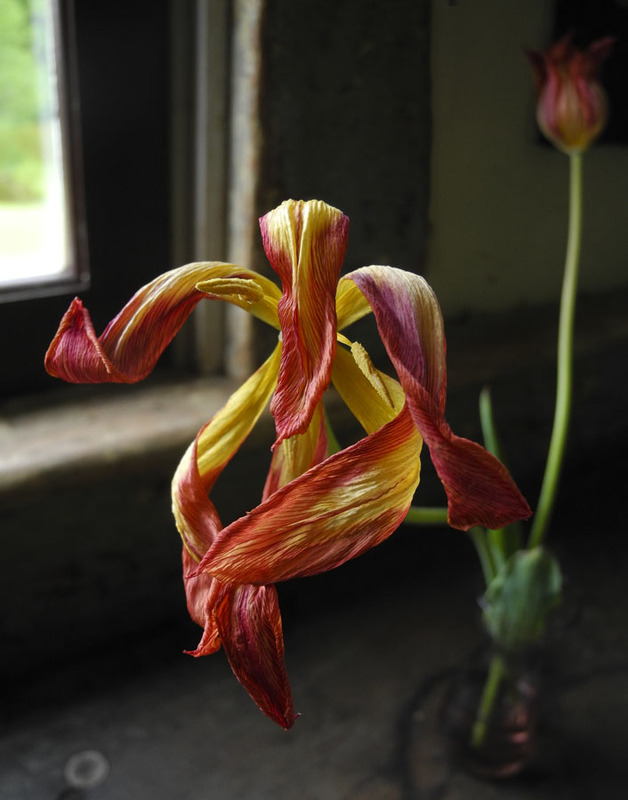 There is even beauty in the flower as it dies, the petals gracefully dancing their way out of life. Linked, egg tempera on calfskin parchment, 5 1/4 x 9 1/2 in. I never show my source photographs for a very good reason: they have more "reality" than the paintings I make from them, so can seem more appealing and stronger; they can give a mistaken idea of what I'm after in the work. 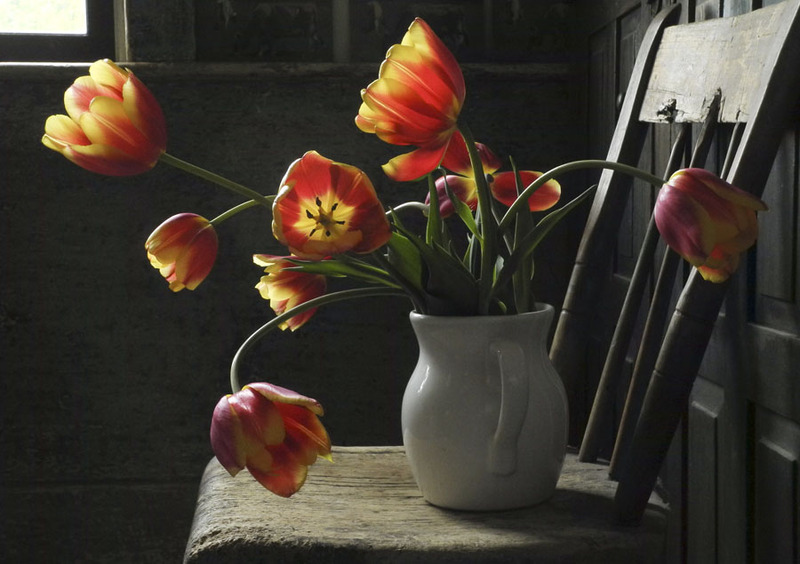 Here on this blog we are looking at a digital image of a physical painting and a digital image of a digital image; if we were in my studio looking at the painting and a print of the photo, the relationship between the two would be reversed, with the painting having more presence. But I wanted to speak to the way I transform the photo, so showing it will help in my explanation. 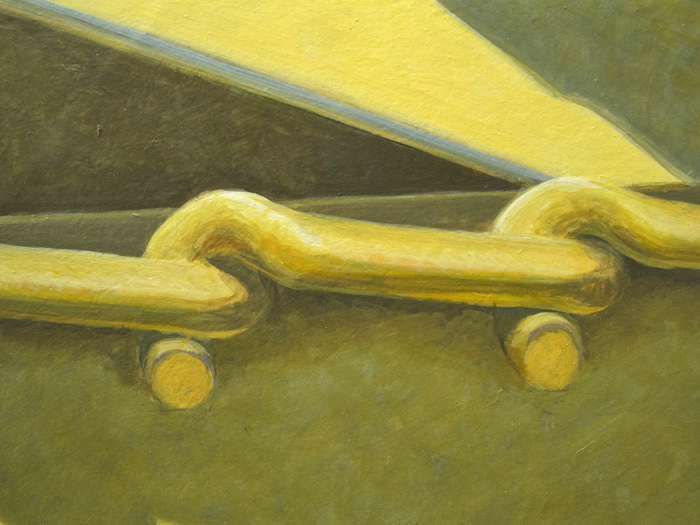 The most noticeable change is that I simplify the given image, leaving out details of wear and rust and dirt, in order to take the work out of the specific and into more formal concerns––color, shape, light, composition––and into something beyond the ordinary. What grabbed my eye were the repeating links, lined up in a subtle tilt upwards, with the stronger diagonal below them. Those two elements, along with the odd shape of cast shadows, were my focus. But what to do with the rest of the composition? I tried many different approaches: making the background very dark, as in a Spanish still life painting, but it looked awful. 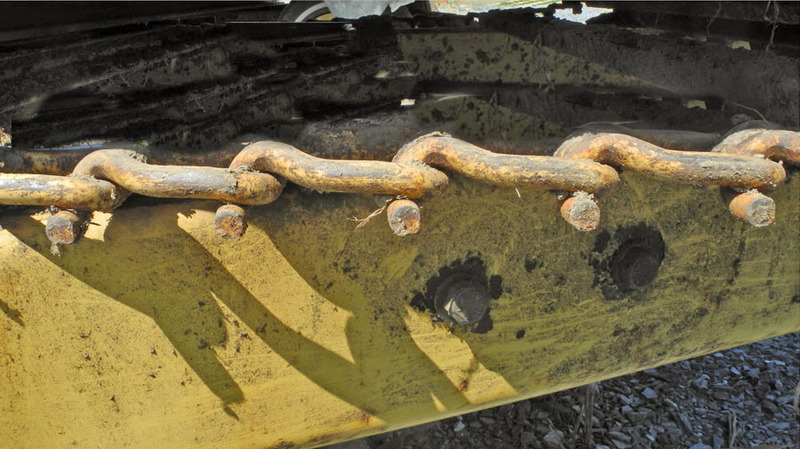 I tried adding some of the complexity that was on that machine behind the links but that didn't work either. I tried different colors, different shapes. What I finally settled on was a diagonal above the links that was opposite to the main diagonal below, with a shadow running across it. This shape was invented to serve a compositional need. As for color, I ended up with variations of yellow; I'd tried black, blue, red, brown, for the bottom right and upper left triangles. I painted this picture using Titanium white, two yellows––Cadmium yellow medium and light––Cadmium red medium, and Ultramarine blue, for me a limited palette. The point of all this is that I am not trying to make a realistic rendering of an observed object, though I continue to love the visual pop of a three dimensional illusion of form. 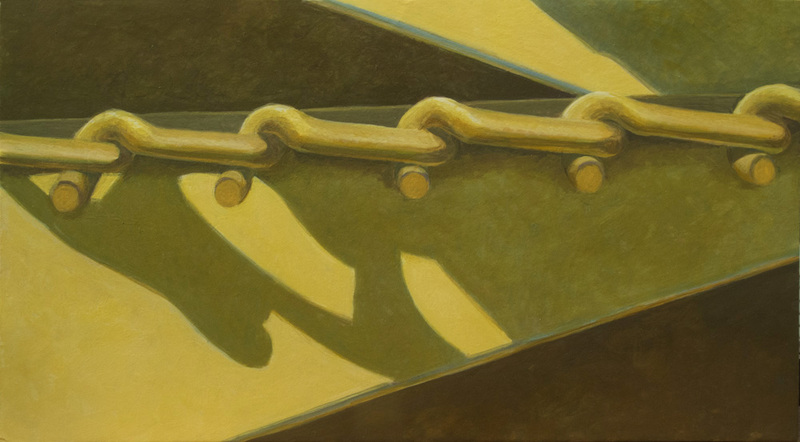 I am very tied to the visual world in my paintings, but it is only the foundation in my construction of an image. Although today wasn't a beautiful day––it was gray, warm, and windy––I spent a lot of time outdoors doing various tasks. One thing I wasn't doing was mowing the lawn, and as I walked around, I noticed a lot going on besides grass (though actually my lawn has very little actual grass). There are lots of small flowers blooming right now, tucked here and there, out in the open, under trees and shrubs, along walls and borders. 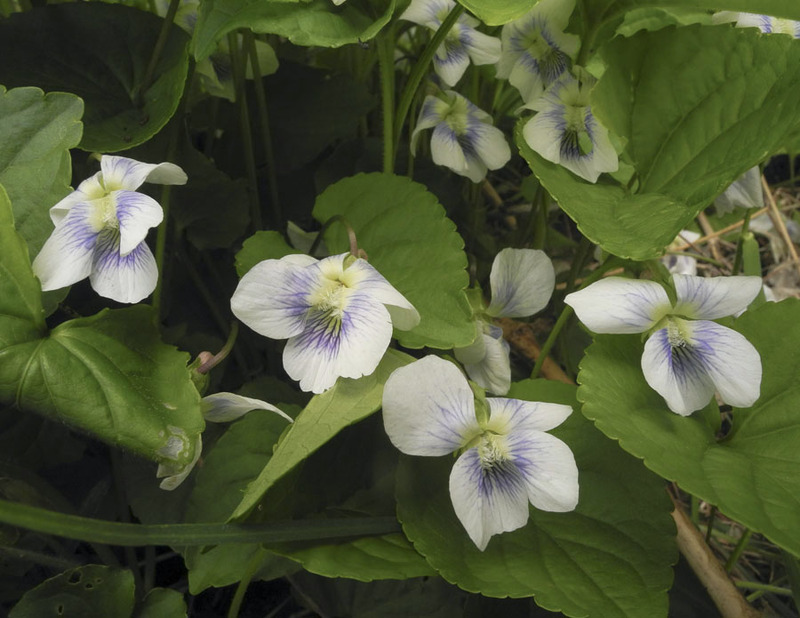 There are masses of white violets under the lilac and spreading out into the lawn. 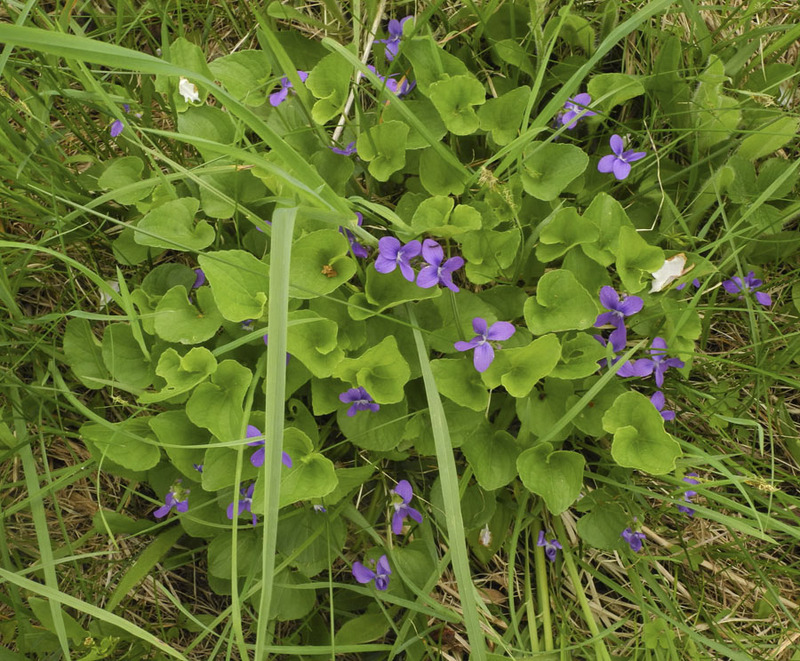 Where the grass is longer, a few clumps of violets are growing, looking like perfect bouquets. 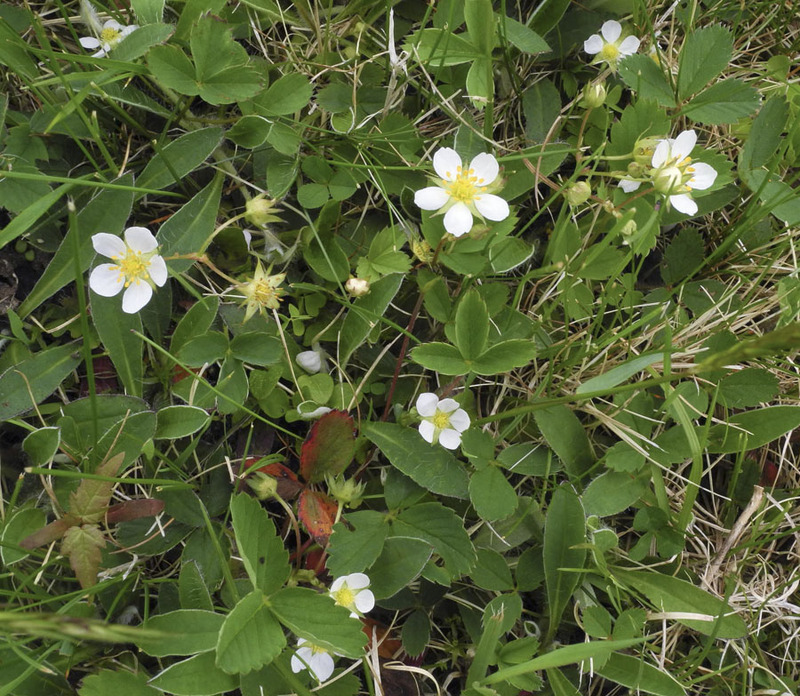 The white flowers of wild strawberries brighten the ground. 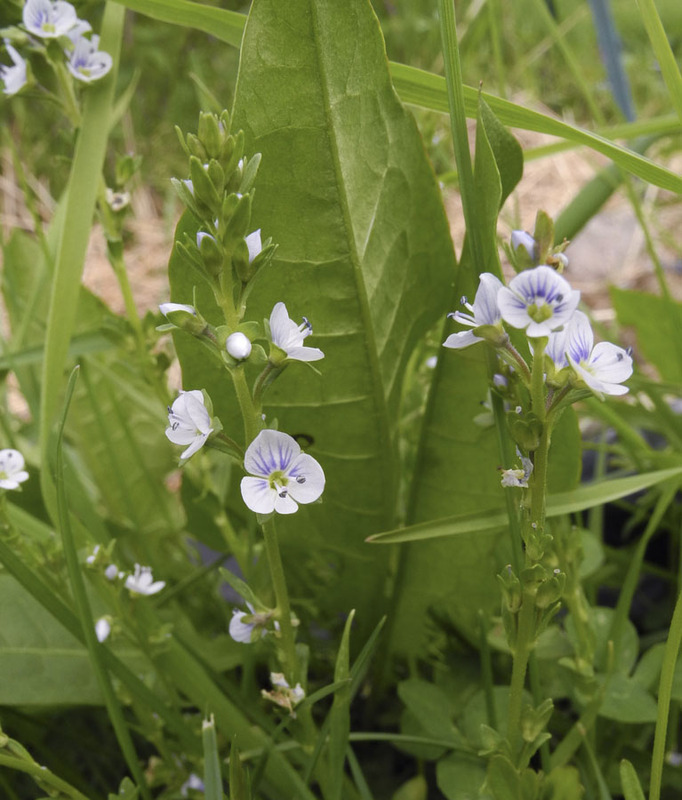 Then I noticed that the tiniest of wildflowers are also blooming: the clear blue flowers, about 3/8 inch across, of what I think is a speedwell. Near them, next to the raspberry patch, an even smaller white flower, less than 1/4 inch, with thin purple lines on its petals; they appear as a white froth in the midst of green. I don't carry a magnifying glass, so the camera helps me to see details I would miss with my eyes alone. 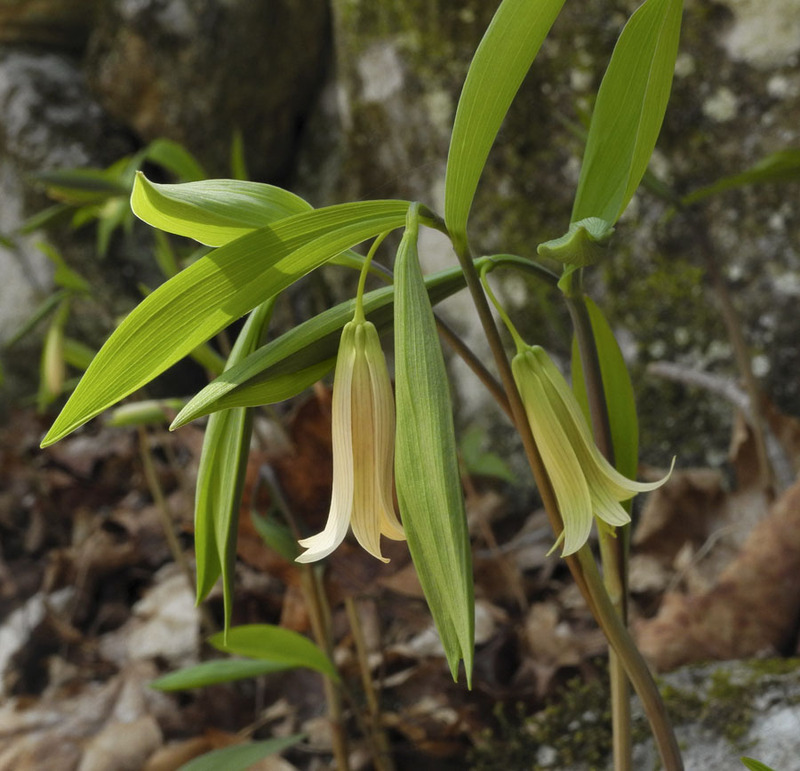 And I made a recent discovery: what I thought was only a woodland wildflower, bellwort, is now growing in profusion along the stone wall in the orchard. 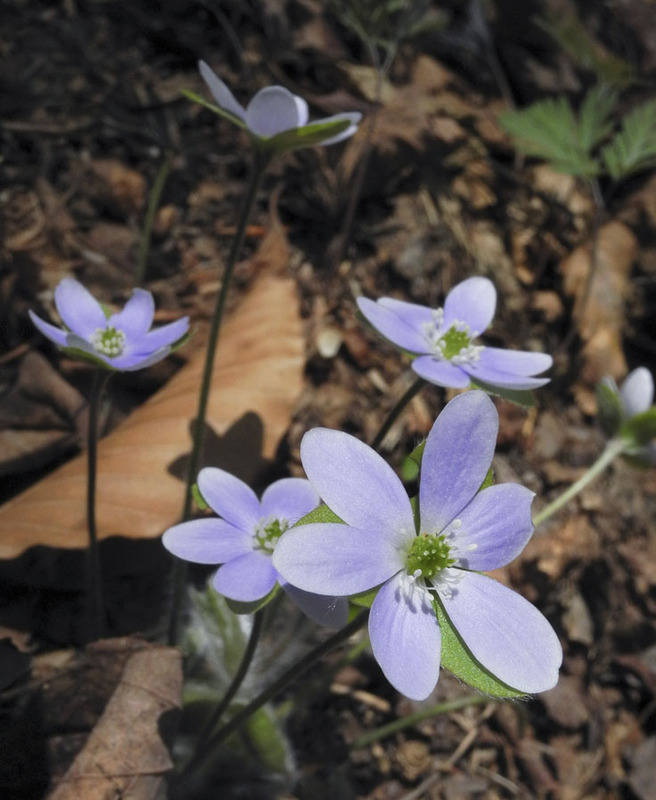 Its delicate drooping leaves are making a beautiful ground cover, now enhanced by the pendant blooms. Not all the small flowers are wild; there are the Johnny jump ups, which began as a cultivated plant (it's hard for me to remember when I must have planted some) but now self seed all over the vegetable garden and sometimes show up in flower borders. The plastic milk jugs you see behind the flowers are protecting my newly set out tomato plants. 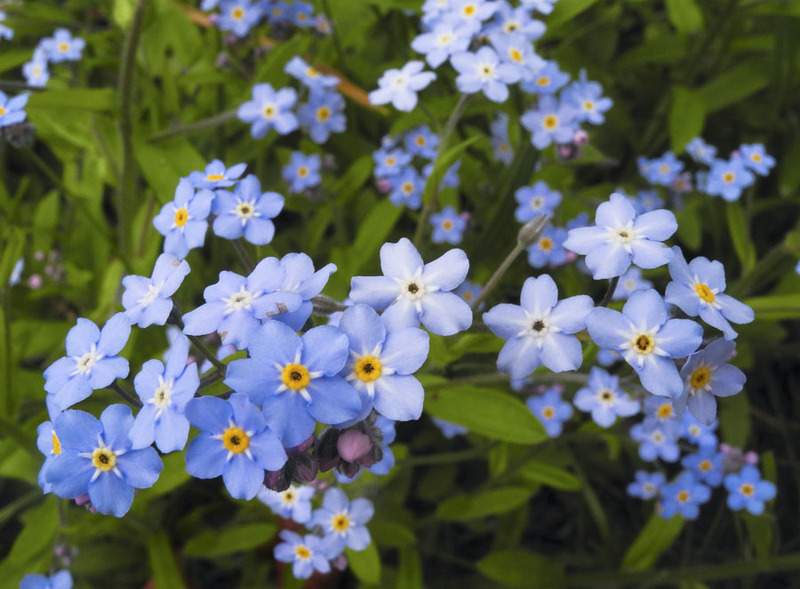 Another delightful self seeder are the Forget-me-nots, a tiny clear blue blossom that sings out its bright color. I never know where they'll appear next and they are always welcome. 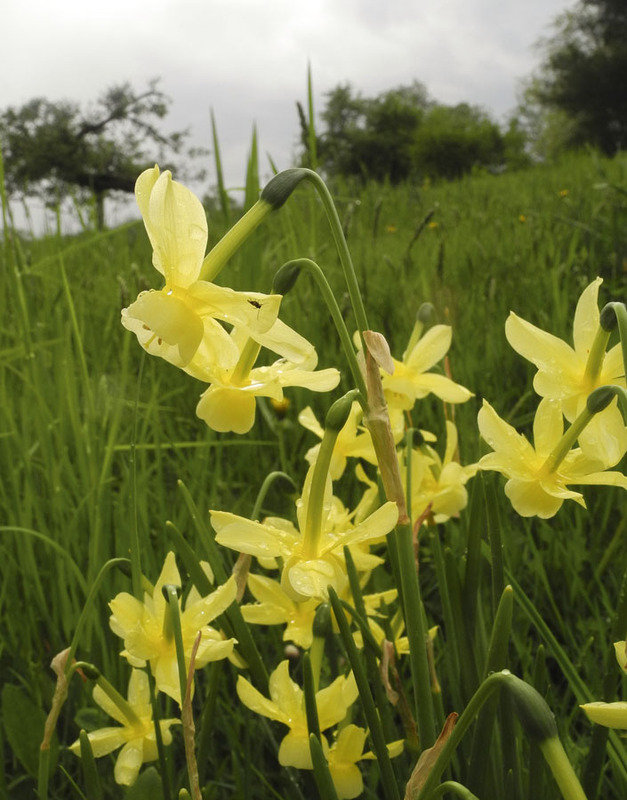 These narcissus, Hawera, are the tiniest ones I grow, airy little flowers that seem to float on the breeze. 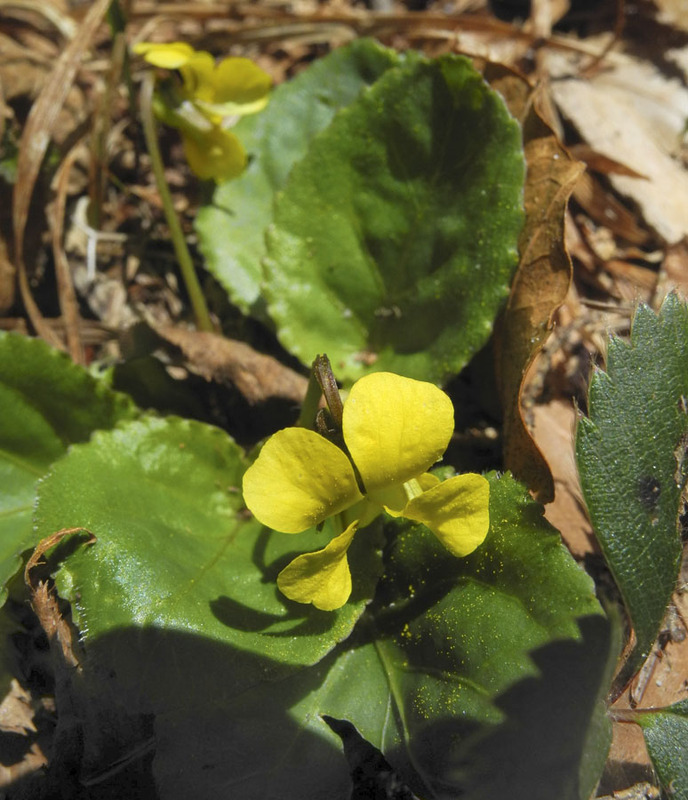 The pale yellow cup is less than 1/2 inch wide, with the back swept petals, the flower is about 1 1/2 inches across. Each flower is very small, but when massed, they are charming. 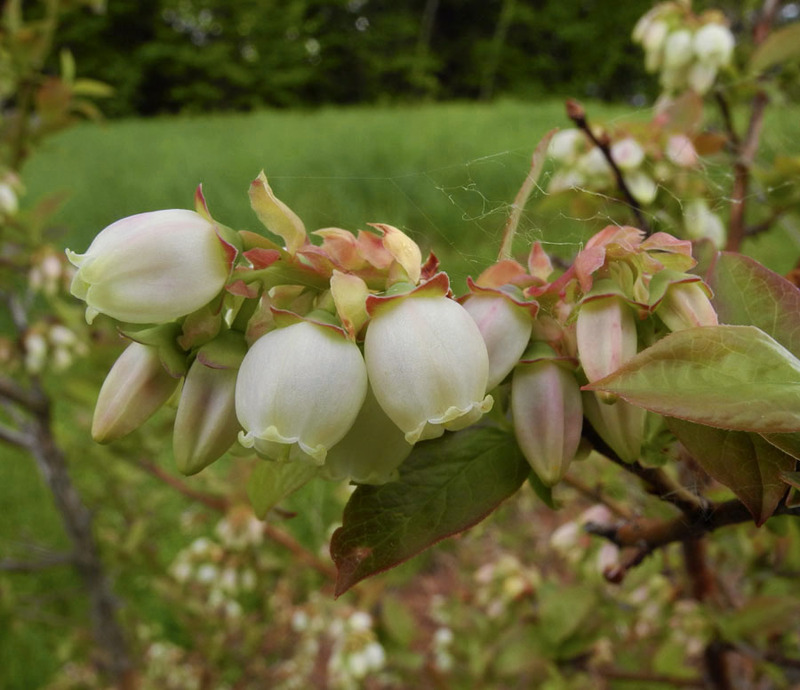 Here are the most cultivated of all the early spring flowers I am showing, the ones that take the most work and care: blueberries. I love the forms of the flowers before they open, with their elongated and crenellated buds. Opened, they have a round shape with an upturned frill at the bottom, a fanciful design. 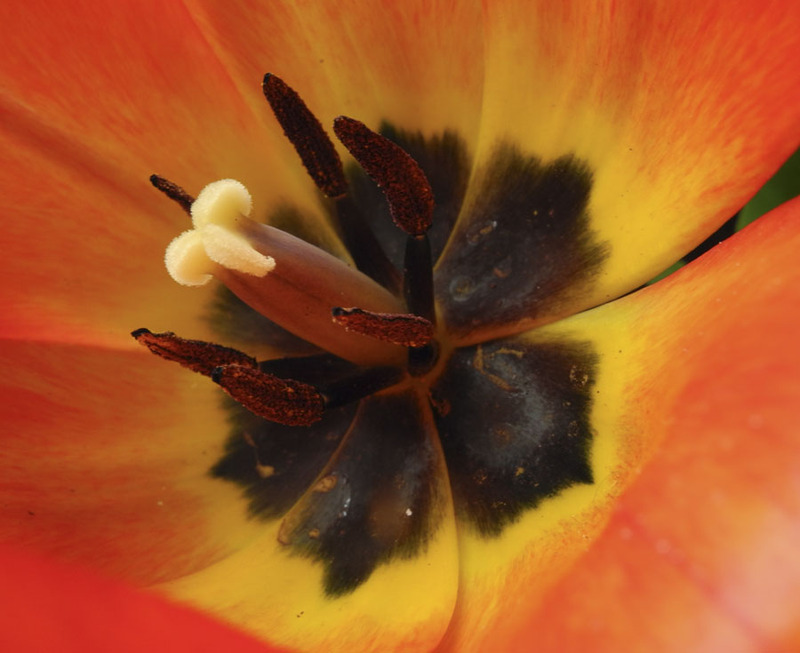 Pollinators have to poke their way inside to get the pollen. I wonder if it is as delicious to them as the berries will be to me. Until then the flowers are an aesthetic delight, as are all the others that populate my lawn and garden. A fluid gesture, free and quick, moves color across the surface, each a different weight and texture, masses balancing lines. The the artist chef begins to add elements. I want to say "stop, stop, it's so beautiful as a minimalist composition!" 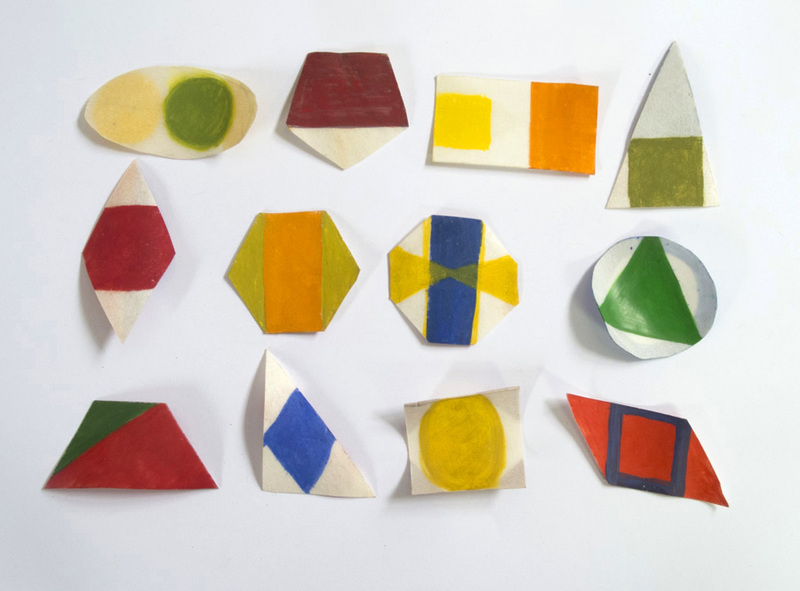 But more things are added until the plate becomes a gorgeous layering of color and shape, expressive and lively. Watching this dish being composed was like seeing the process of a painting, from the underpainting to its finish, but this also had to taste good. This is the gargouillou of Michel Bras, a celebrated French chef, who with his son Sébastien has a 3 Michelin star restaurant in a small village in the south. It is one of the beautiful dishes in the film Step Up to the Plate (Entre les Bras), a documentary about these two remarkable chefs who take their inspiration from the land around them (thanks to my friend Helen Rabin for the recommendation). The two men worked closely together at their restaurant for 15 years; the film follows their relationship and the tensions that come from Michel having decided to retire, to pass on his life's work to his son. What most interested me in watching this documentary was seeing the development of dishes, and how important their visual aspects were. 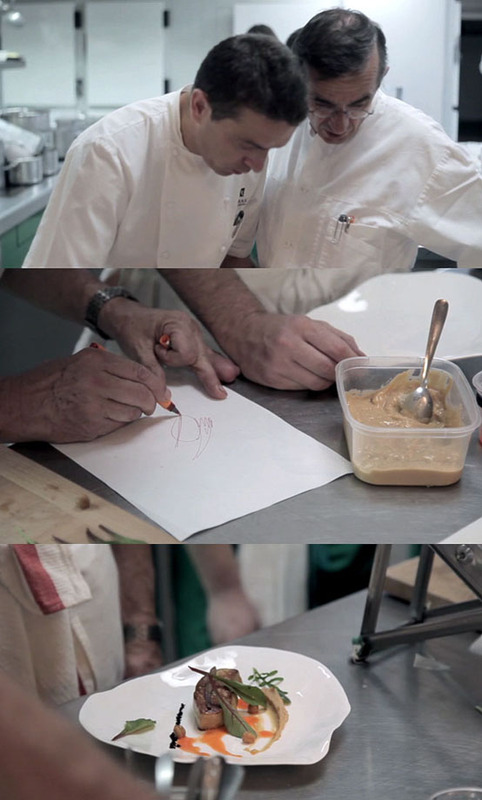 Above Michel and Sébastien confer, using sketches to figure out where elements would be placed, often disagreeing about it. Sébastien placed the anchovy draped off the central form, but Michel insisted it should be on top. These small compositional adjustments are so very much like those a painter or other visual artist would be considering. We follow Sébastien as he thinks about a complex dessert dish he calls "The Pathway", as he sees it as his story. He looks, he considers the elements, he makes sketches and notes. He asks his father for a critique. He creates a similar dish at the Bras restaurant in Japan, using Japanese ingredients, but in France he is not satisfied; how many of us will say we are not sure about an artwork? "Needs improvement still" is always the case for art; never be completely satisfied, continue to search and develop. Bras ended by separating his dish into three essential parts, representing three people: the bread is the father Michel, the blackberry and laguiole cheese his mother, and the milk and chocolate his Granny Bras. It began with savory and went towards sweet. So the dish is not only formally beautiful, richly delicious (though I have to rely on others for that assessment) but it also has meaning. This food is so much more than just a meal; the care and creativity with with it's made elevate it into an art. My attempts in the kitchen are like those of an amateur Sunday painter compared to les Bras. A completely different kind of artistry is practiced by sushi chef Jiro Ono in his tiny restaurant located in a subway in Tokyo, austere and direct, with the emphasis on flavors. 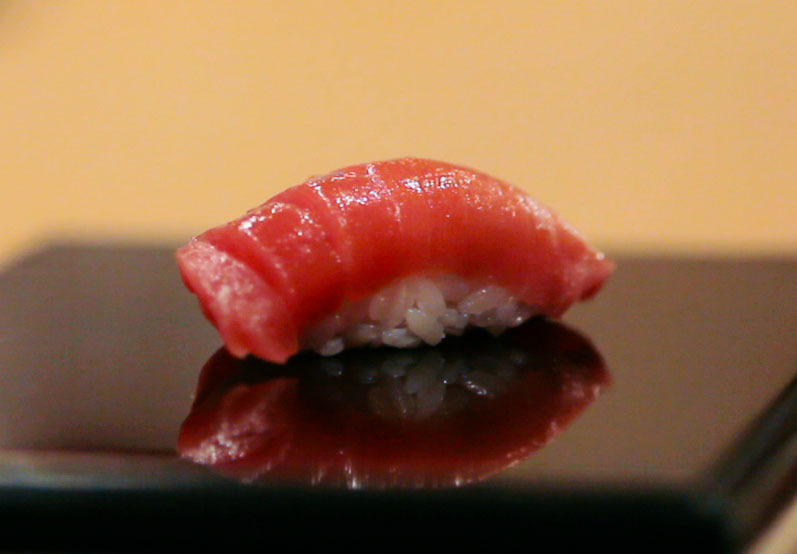 The documentary about him, Jiro Dreams of Sushi, has a similar theme to Step Up to the Plate: an aging father, a brilliant 3 Michelin star chef, is getting ready to pass his life's work on to his son. For both older men, their restaurants have been their passion and their life. 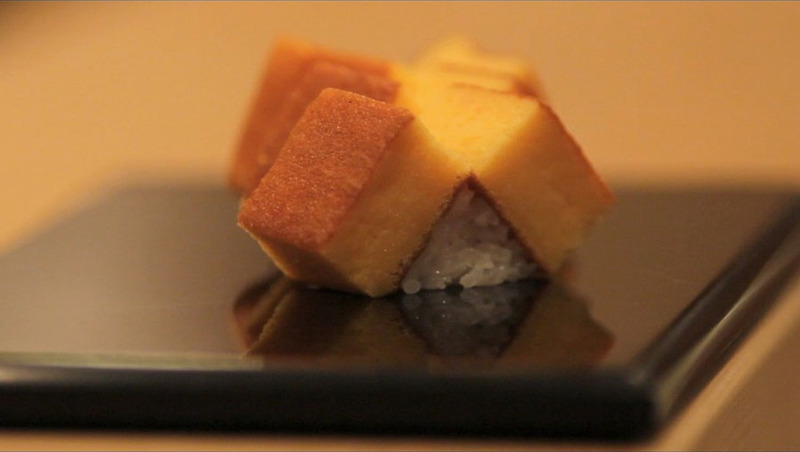 From watching these films, I got a sense of Jiro being the more relentless in his pursuit of perfection; his means are so much simpler––mainly rice and fish––so the focus is that much more intense. What is clear about these chefs is that they are artists, approaching their work with the same questioning, passion, and searching for depth and beauty, as artists in any other field. 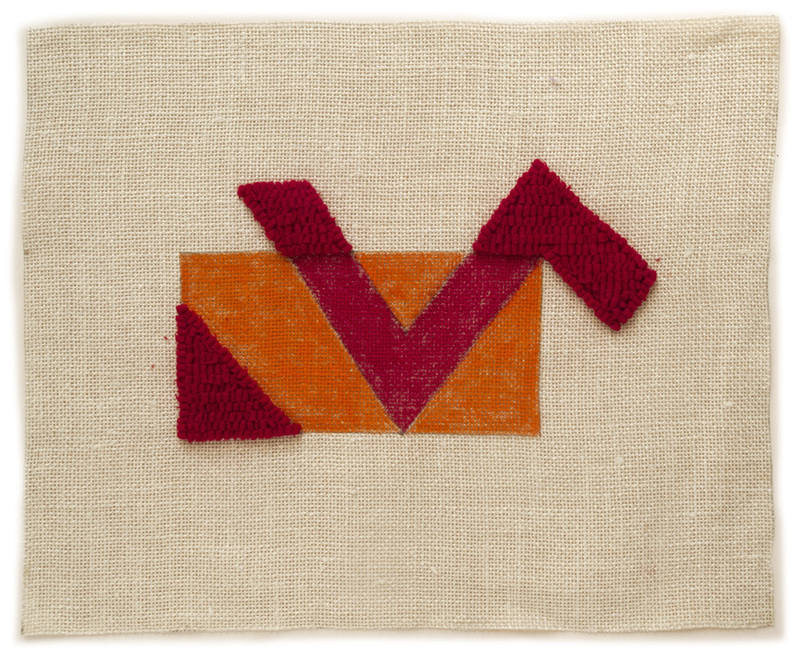 2014 #8, hand dyed wool and egg tempera on linen, 15 x 12 in. I've been enjoying the all-over compositional strategy for my hooked wool drawings; I like the energy that comes from forms that cross the surface, moving the eye around and through. 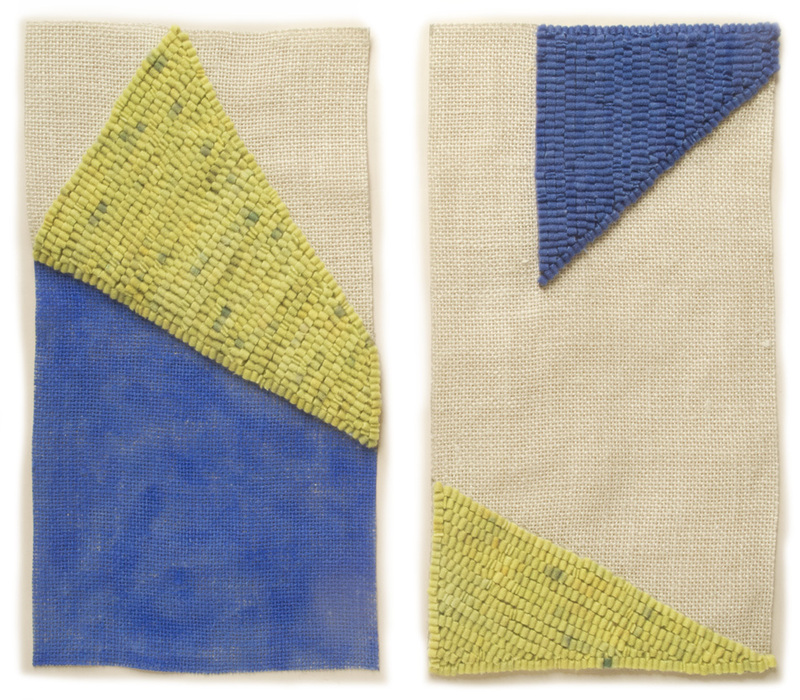 2014 #9, hand dyed wool and egg tempera on linen; 2 panels, each 14 x 8 in. The jump across panels moves from painted to hooked surface; expectations are flipped. The downward blue triangle is similar in color to the blue on the left panel, moving the eye from upper right to lower left. 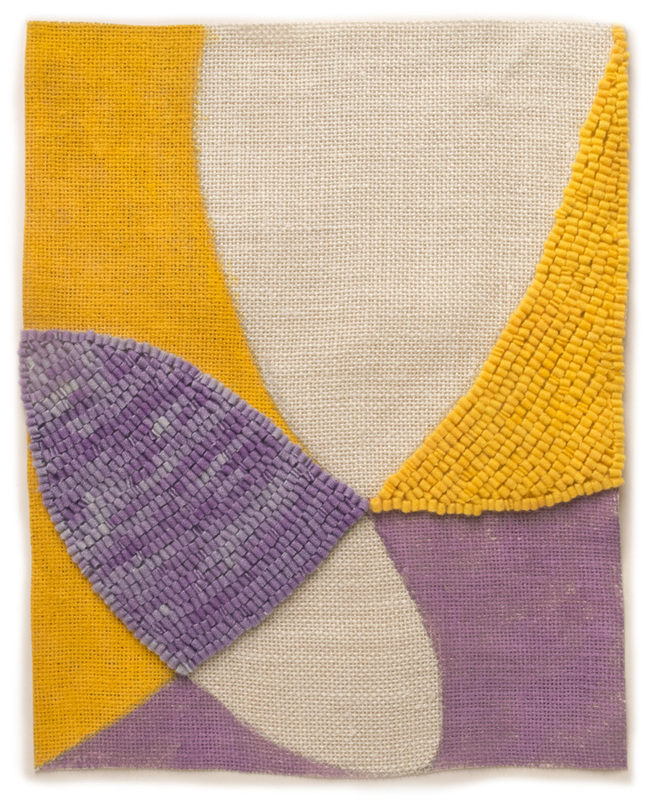 2014 #10, hand dyed wool and egg tempera on linen, 13 1/4 x 16 1/4 in. 9 3/8 x 5 x 3 1/4 in. See hi-res images here. The collections at the Metropolitan Museum of Art are so extensive and varied that I can always discover something that I hadn't noticed before. When I went to the gallery 352 containing African art during my last visit, I was struck by this small portrait head, so sensitively rendered and so powerful. The pendant mask of the Queen Mother has a perfect blend of naturalism, and simplification of form, realism and idealism, which makes the work seem of this world, yet transcends it. The warmth of the material, ivory, adds more life to the sculpture. 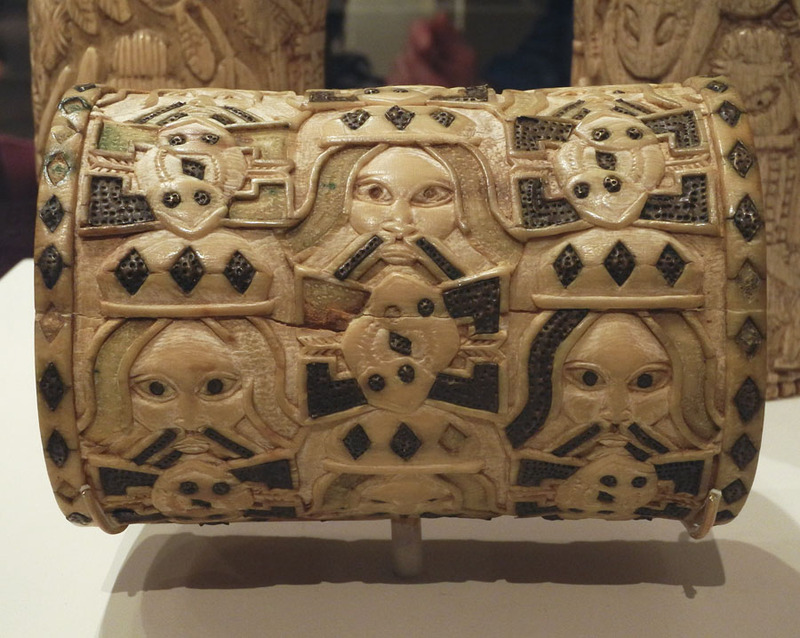 I learned, on the Met's website, that for the Edo people ivory is "related to the color white, a symbol of ritual purity that is associated with Olokun, god of the sea." King Esigie honored his mother Idia with this portrait; it is a rare depiction of a woman in Benin's art. 5 1/8 x 3 9/16 in. This long bracelet, which would have been worn by kings or chiefs at important festivals, is a inventive combination of figurative and abstract elements. Like the ivory mask above, its color white is related to the god of the sea. From the sea came the Portuguese, whose faces are stylized on this work, and on the crown of the Queen Mother above, along with mudfish, a symbol of the King's nature as human and divine, as they live on land and in the sea. 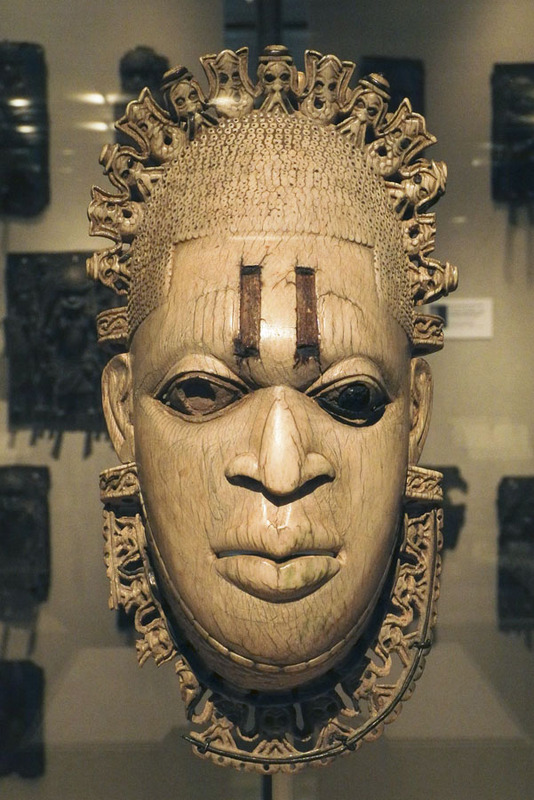 The Portuguese brought wealth to the Kingdom of Benin with their trade, much of which was in ivory. 15 1/2 x 5 x 15 11/16 in. 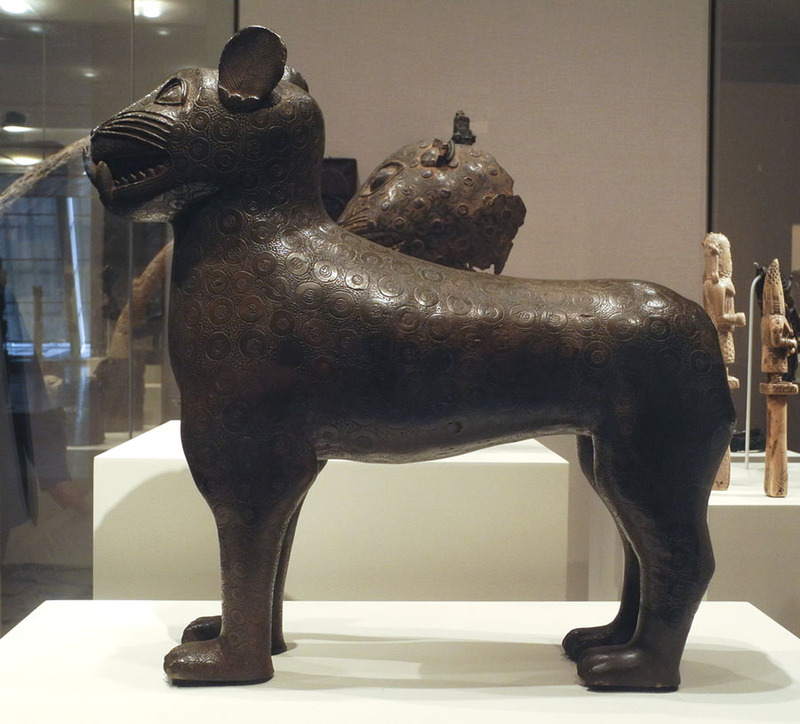 The artists of the Kingdom of Benin also had great sensitivity when depicting animals. This sleek leopard with his decorative spots stands solidly on his feet, his face alert and expectant. 12 x 23 5/8 in. The elephant is another elegantly rendered animal, made much later than the leopard and by a different culture. I love the heft of its body sweeping out to the line of the upturned trunk. 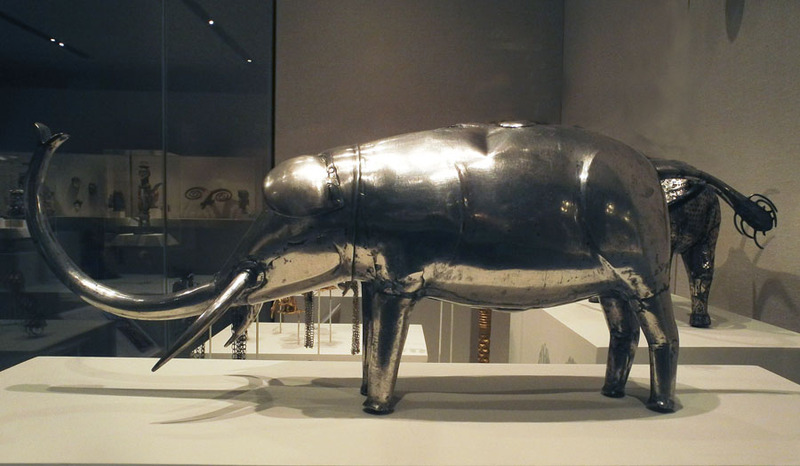 In the extensive information on this work on the Met's website, I found out that the elephant is associated with Dahomey Kings Guezo and his son. The elephant is a symbol of "strength, royal legacy, and enduring memory". An object of silver carried with it power and prestige. Staff, Republic of Benin, Kingdom of Danhomé, Fon peoples, 19th-20th century; silver. 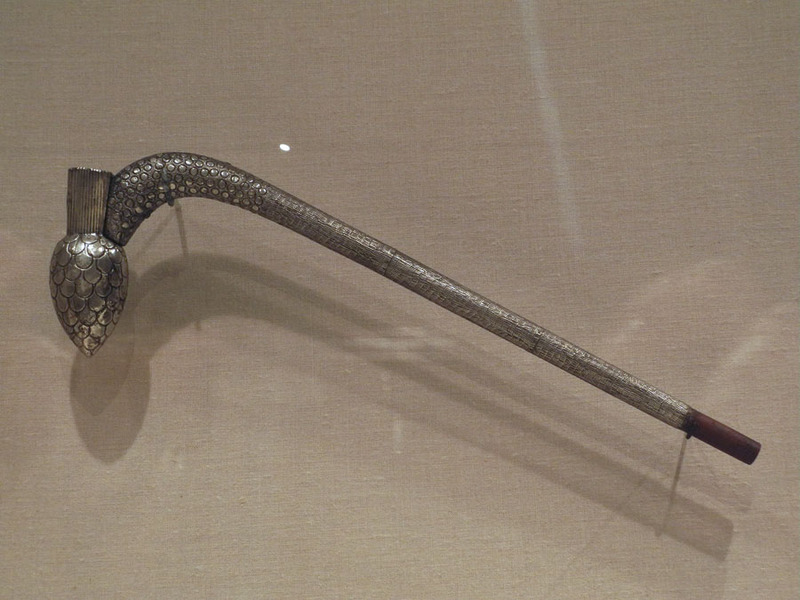 Another silver work from the Kingdom of Dahomey (there are different spellings on the website and on the museum explanatory labels) is this intricately designed ceremonial staff. The rounded shape at its end seems to be a plant form, but there was no information about the work on the Met's website. Like the elephant, I can imagine that it has a symbolic meaning. With all the work I see from another time, another culture, I admire the beauty I see but I am also always interested to enlarge my understanding of their meaning. 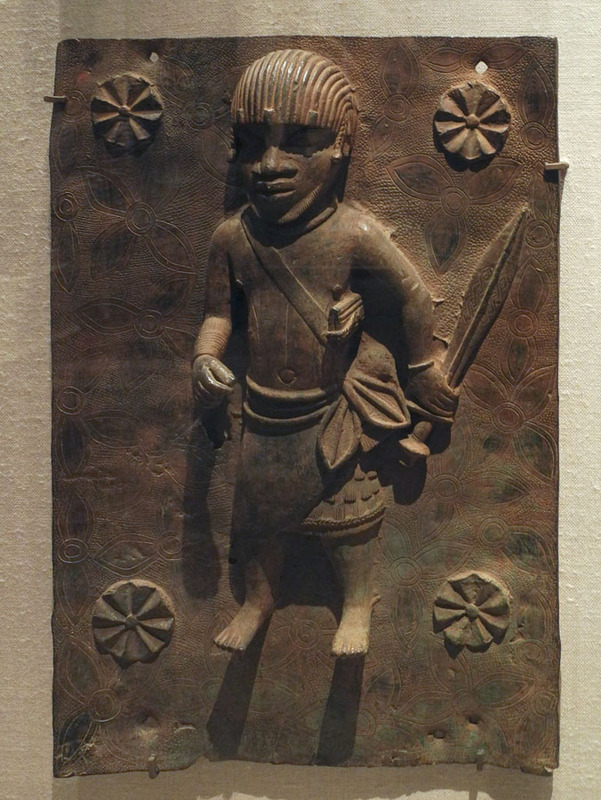 Junior Court Official with Sword, Nigeria, Kingdom of Benin, Edo peoples, 16th-17th century; brass. Warrior, Nigeria, Kingdom of Benin, Edo peoples, 16th-17th century; brass. 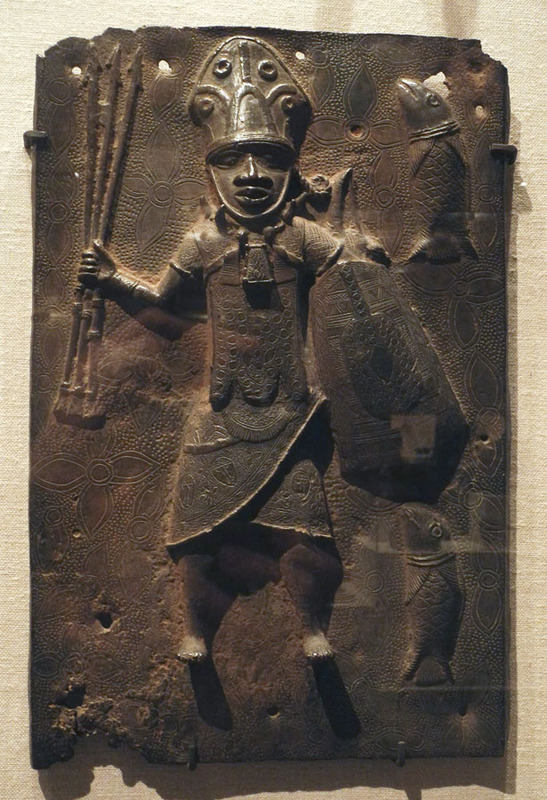 These lively plaques are part of what had been a large installation on the exterior of the extensive palace of the Kingdom of Benin in the 16th and 17th centuries. A 17th century Dutch visitor described wooden pillars in the palace complex being covered with them from top to bottom; there are 900 extant today. It must have been a remarkable sight, certainly as dramatic as a European castle wall covered with tapestries. The plaques pictured the various men who would be part of the court, singly or in groups, with their characteristic attire. Why is the warrior accompanied by fish? I don't know, but the arrangement of them on the surface, and of the medallions on the one above, show a care in the formal arrangement of shapes. I've always loved the medium of relief sculpture––you can see some examples in my blog post on relief sculpture at the Met––and these pieces are a strong part of that tradition. 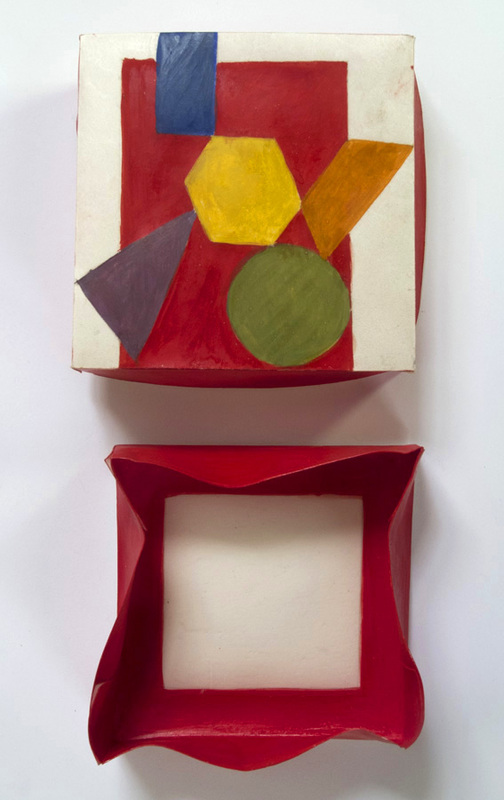 A New Boxed Paintings: "Shapes"
Shapes, egg tempera on calfskin parchment, 3 x 3 x 3/4 in. 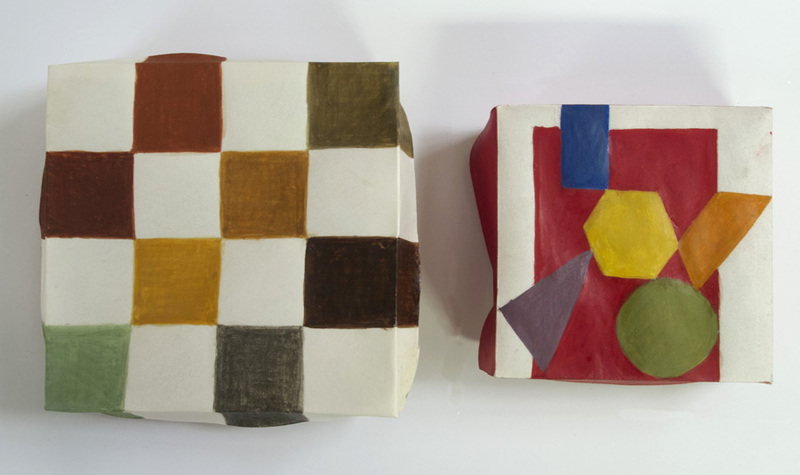 When I was working on my last boxed paintings, Squares, which you can see here, I first made a 3 inch square box to contain the paintings, but realized that was too small, so made a 4 inch box. I did keep the 3 inch box though, and thought that a project using shapes might work with this size. 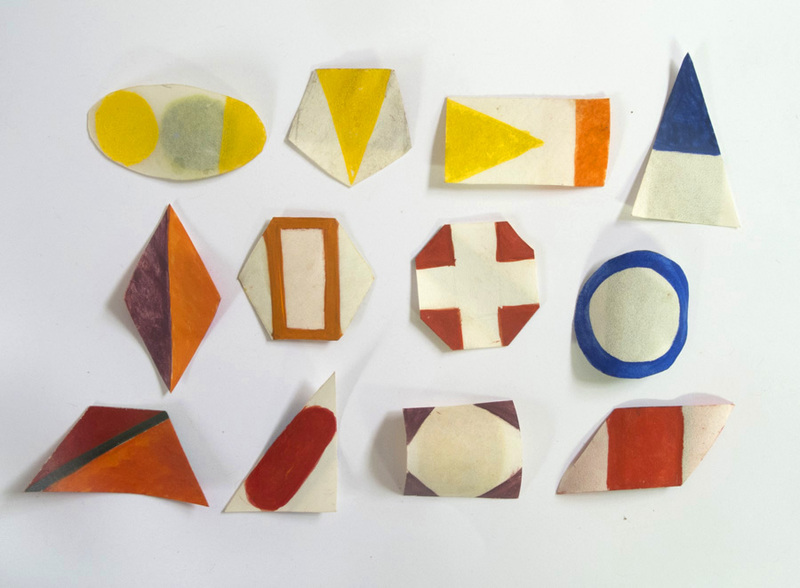 So I began cutting out shapes: rectangle, square, triangles, circle, oval, octagon, pentagon, hexagon, diamond, trapezoid, parallelogram. I give a preview of what's inside the box by the several shapes on the cover. I had a hard time deciding how to paint the inside of the box, even discarding my first attempt. I realized that with the complexity of the shapes, I needed a very simple background. Shapes, paintings side 1, ca. 7/8 - 1 1/4 in. 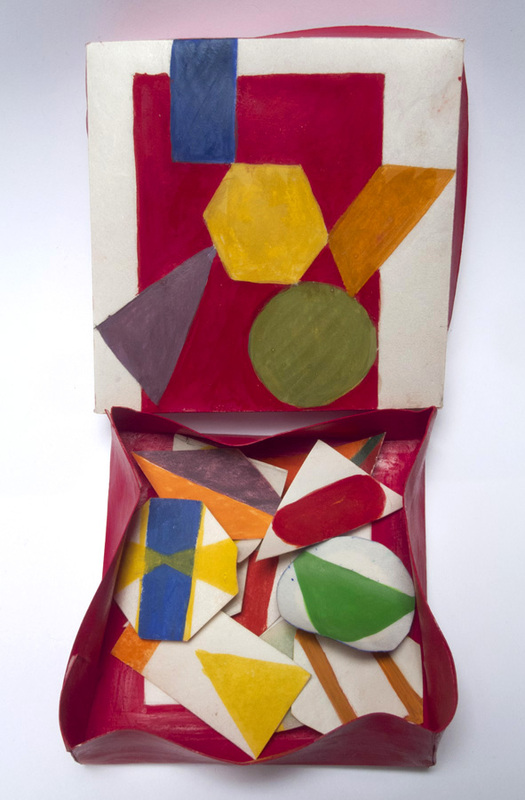 At first I thought I would just paint each shape a solid color, but then decided that would be dull, so I painted shapes on top of the shapes. 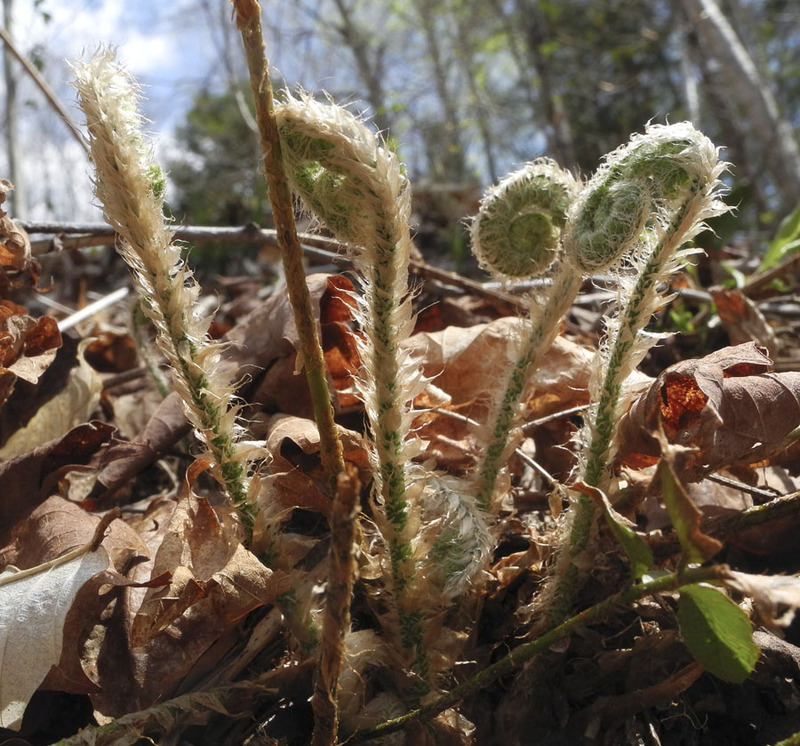 A Walk in the Woods: Ah, Spring's Treasures! I hadn't been in the woods in weeks––bad weather, traveling, an awful cold, and intense vegetable garden work all kept me away––but on Sunday I did my familiar loop. What an immense change had occurred in those few weeks! 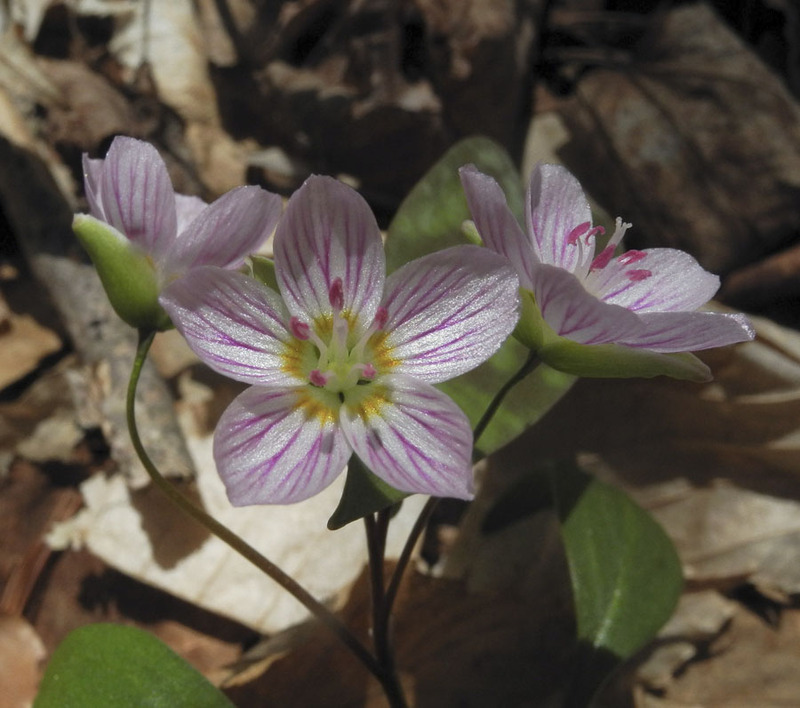 It was now true spring, and carpets of tiny woodland flowers decorated the path, with the delicate magenta-striped Spring Beauty, Claytonia virginica, most abundant, and so cheerful. 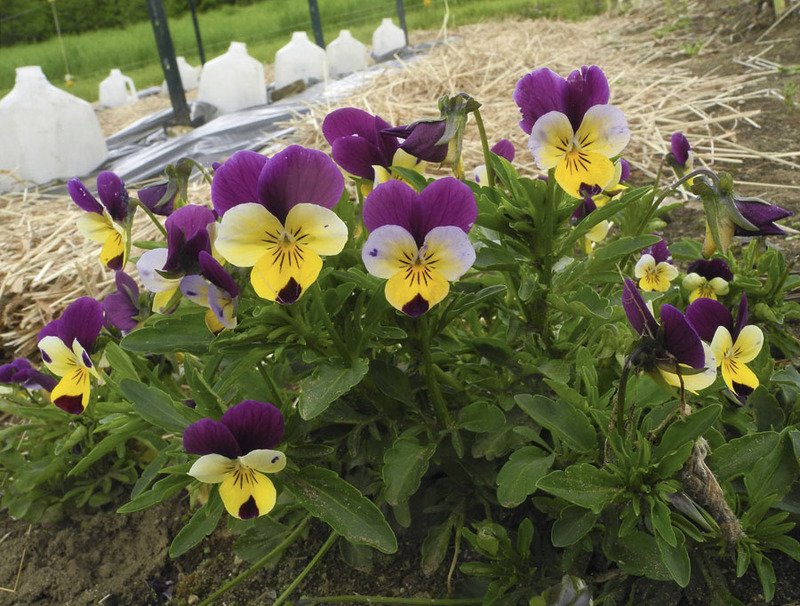 ...and purple violets. 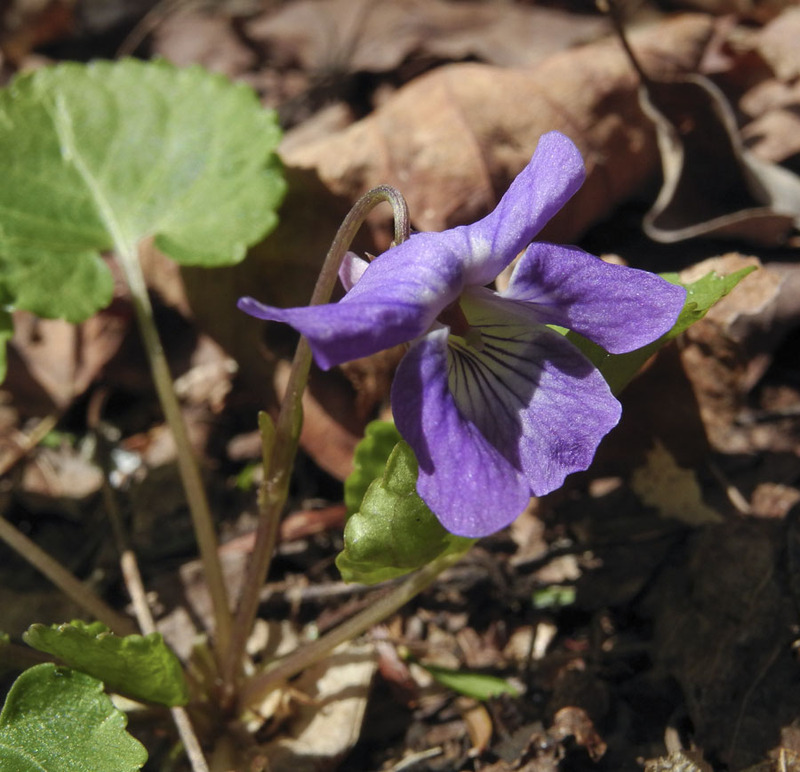 With their downward nodding heads, the violets seem a shy flower, so it's even more of a pleasure to notice them. 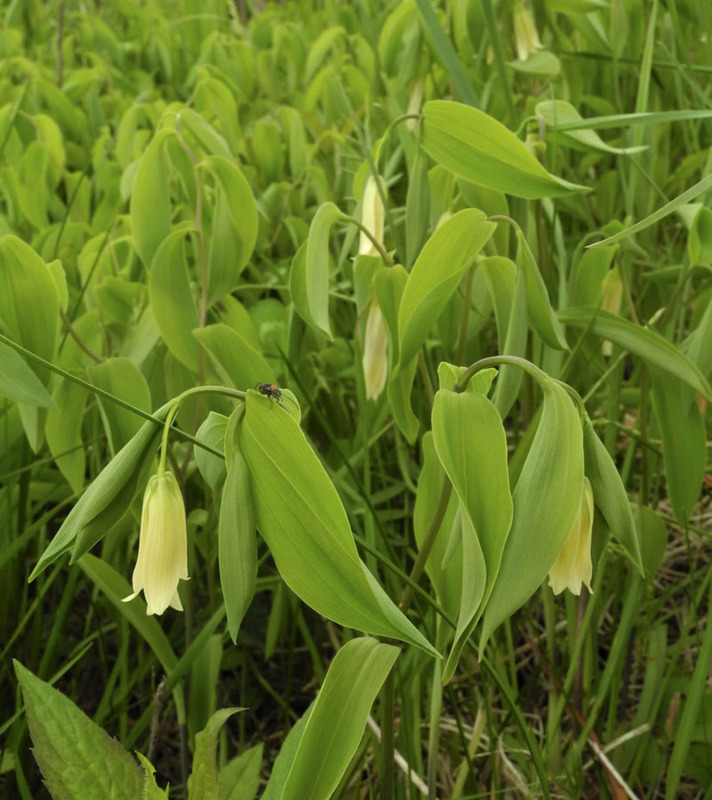 Another of my favorite woodland wildflowers is Bellwort, a graceful and delicate beauty. It has spread along a stone wall that bounds the path, this section of which is an "ancient road"; farther along is a very old cellar hole, evidence of earlier occupation. 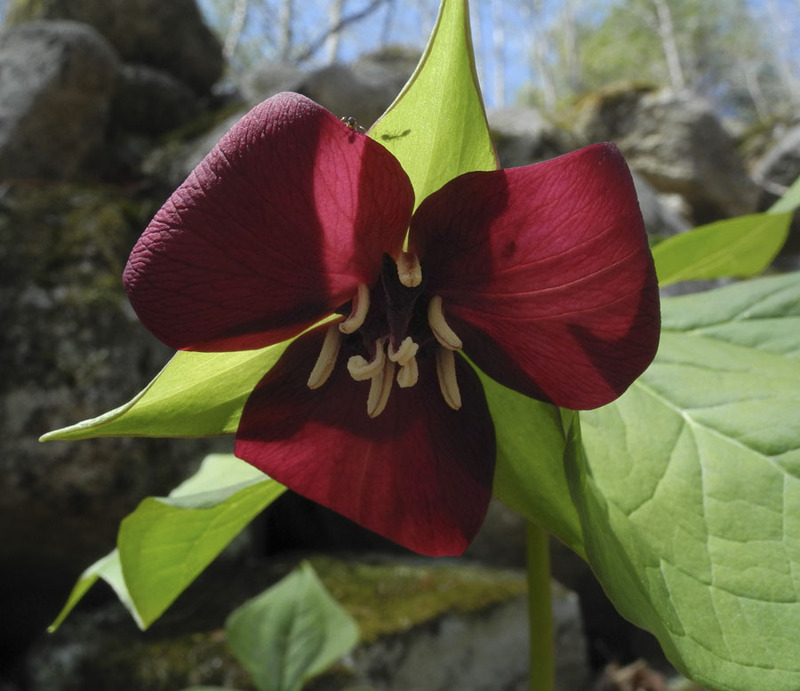 Along the same stretch of road are the most spectacular spring flowers, Trillium erectum, aka Wake Robin. 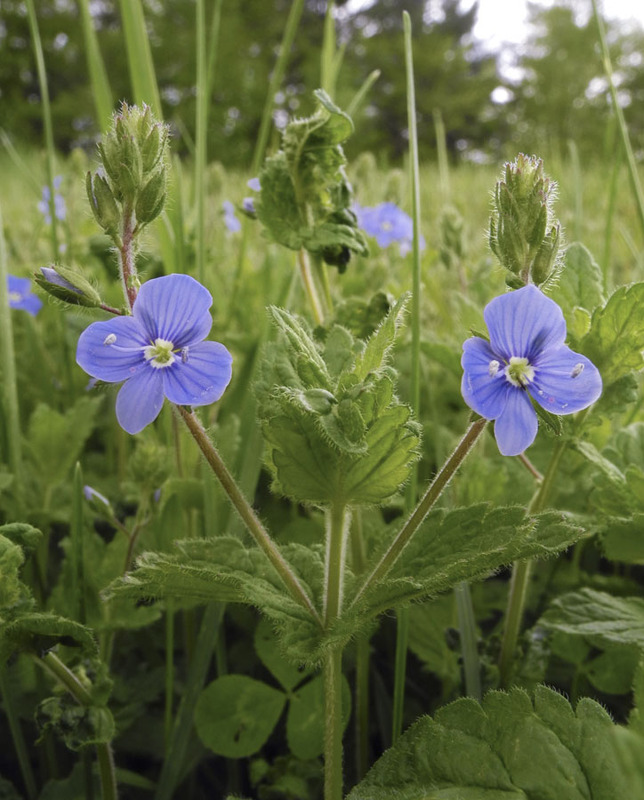 The flowers are large, a good three inches, with only 3 petals and very large leaves. They seem almost too showy and grand to be wildflowers. If you enlarge this photo by clicking on it, you'll see an ant walking across the edge of a petal and the shadow of another on a leaf. It is a busy time for the insects too. 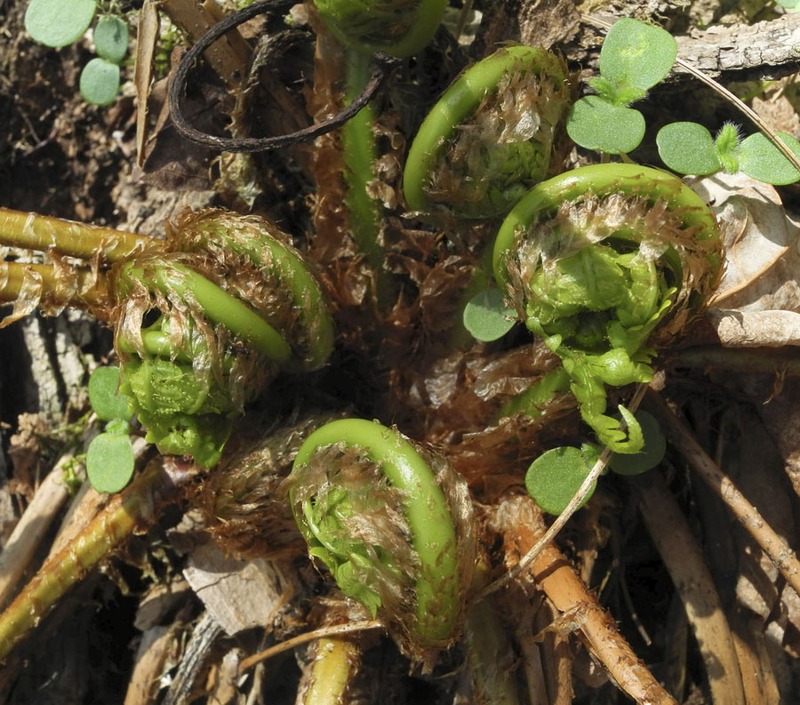 It's not only flowers that show their beauty in early spring; as new fern fronds emerge, each species with its own form, they seem as though they are dancers gracefully swaying to silent tunes. Or like Busby Berkeley dancers, they curl towards a center, ready to unfurl outwards, spreading their blades wide. In the woods there's not only new green life, but also seeds and seed heads ready to spread thousands of tiny seeds for new plants. This is the seed head of the marvelous and unusual Indian Pipe plant, a plant that is white because it's without chlorophyll; it lives by being a parasite on its willing hosts, trees and fungi. 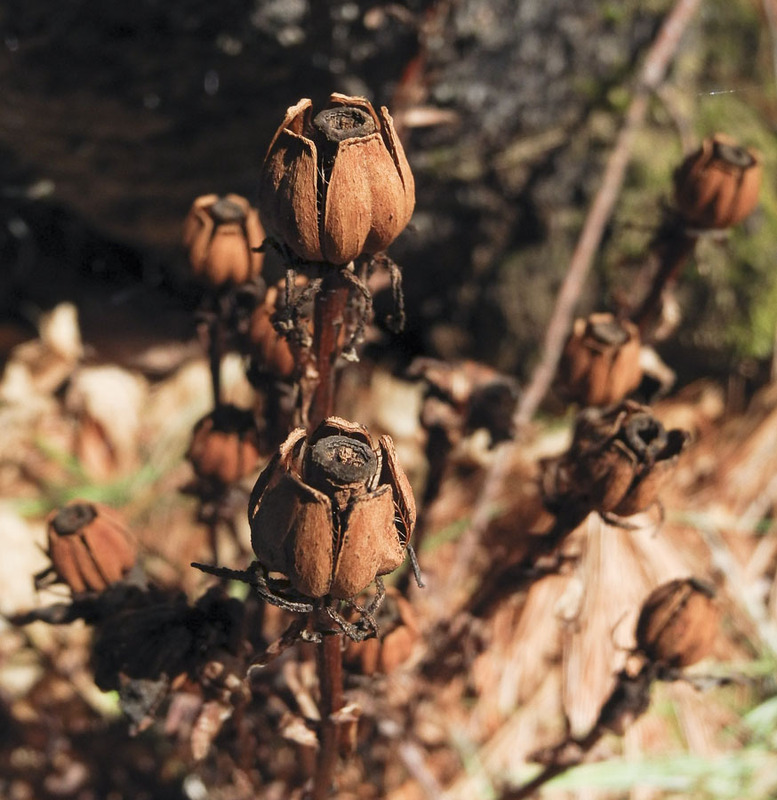 You can read more about this strange plant at the link. I always feel happy when seeing their white apparition in the woods, and I felt very lucky to have found these beautifully formed seed heads. Each year, each season, all these wonders delight me afresh, as though I am seeing them for the first time.